Save Money With a Lower Rate!Customers in the Orange & Rockland service area can choose their energy supplier. Alternate suppliers can offer savings and environmentally-friendly energy options. To learn more about energy supply options in your area, check out our pages on energy in New York, or call us directly at 347-410-8789 to find the best rates in your area. Name, service address, date of next meter reading. This section describes the delivery portion of your electric bill. Exact meter readings: Jan 29 reading (Actual): date at which the last meter reading was made. The number given (61114) is the count of the amount of kWh your meter is at. Dec 29 reading (Actual): date at which the last meter reading was made. 60597 is the number of kWh of your meter at the last reading. Actual means that it was a real reading, not an estimated reading (estimated readings happen when you utility is unable to make an actual meter reading that time, and uses your previous usage to predict how much this month's usage should be). None of these numbers (61114 and 60597) are what you have consumed last month or the month before. It is the difference between both numbers that is your month's kWh usage. Therefore, the total usage in the last 30 days is the difference between these 2 numbers, which is 517. You have therefore used 517 kWh last month. Basic Service Charge: This charge pays for the cost of sending a technician to read the meter, billing and customer service. It is fixed every month, whether you use electricity or not. First 250 kWh (Delivery charge): This covers the transport of the electricity from the electricity source to your premise. This is not a supply charge, it does not vary depending on your supplier, but it does vary according to your kWh usage. Next 267 kWh (Delivery charge): When you use more than 250 kWh of electricity, the cost per kWh decreases. The more you use, the less you pay per kWh. Energy Cost Adjustment: Customers are billed the cost or benefit of electricity supply agreements Orange & Rockland (and Rockland Electric Company) engaged into that ensure service reliability. This can be money that is charged from you if the electricity market price is high, or that is returned to you if the market price is low. RDM Adjustment: The Revenue Decoupling Mechanism works this way: yearly previsions are made each year on the revenues associated with the delivery service to customers. If the targets for delivery revenues are reached, then the surplus is refunded to the customer, and if the targets are not reached, the lack is collected from the customers. SBC Charge: the System Benefits Charge is a charge which supports energy efficiency initiatives, education and outreach, R&D, and energy assistance for people with low-income. RPS Charge: the Renewable Portfolio Standard is a charge which pays for renewable goals set by New York State. 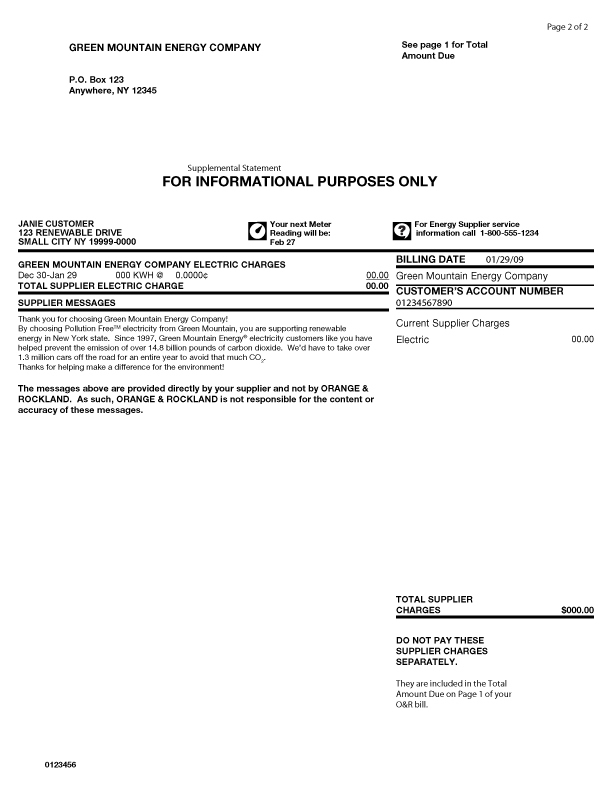 Government surcharges - Delivery: Orange & Rockland, unlike other utilities, regroups certain state charges related to the electricity delivery into this charge: this includes New York State and local taxes, such as state income tax, the Gross Receipts Tax, and local and village taxes (if applicable). The total delivery charges are the addition of all the charges described above. $50.93: These charges are not described in detail in this bill because the customer in this example chose to be supplied by an alternate supplier (also called ESCO), not by Orange & Rockland. If you divide this amount of money by the electricity consumed (517 kWh), the result will be the supply charge per kWh: 9.85¢/kWh. This title defines the type of rate the customer is signed up to. In this case, the customer is signed up to have the gas delivered to his home by Orange & Rockland ("Firm Transportation") for Residential Space Heating. This is the same type of measurement as for electricity, only it will be done on the gas meter, and the unit will change. The unit of measure for natural gas is the CCF, a unit of volume equal to 100 cubic feet. Basic Service Charge: Just the same as for electricity, this is a fixed amount. No matter your gas usage, this cost will be the same fixed amount each month. This includes the cost for reading and maintaining the meters. Delivery Charge: First 3 CCF: For the first 3 CCF of usage, the delivery charge is included in the Basic Service Charge, it is therefore priced at 0¢/CCF. Next 47 CCF: The next 47 CCF of usage will be priced at 34.283¢/CCF. This pays for the maintenance of the grid used to transmit and distribute the electricity to your home. Next 108 CCF: The next 108 CCF of usage will be priced at 32.995¢/CCF. Indeed, if you use an increasing amount of natural gas, the price of that natural gas will decrease per CCF. Adjustment charge: This charge recovers costs related to Orange & Rockland's long-term purchase agreements that ensure service reliability. SBC Charge: Same as for electricity. Government surcharges - Delivery: Same as for electricity. Merchant Function Charge: this is a charge for Orange & Rockland cost to procure the gas, as well as to store the gas, and costs incurred by the company related to credit and collections activities and uncollectible accounts. Total Supplier Charge: This is the addition of the Market Function Charge and the Market Supply Charge of gas (which is not listed in this bill). The Market Supply Charge, even though not listed in this bill, is included in the Total Supplier Charge, and is worth talking about as it is important: it is the price of electricity: it recovers all costs from purchasing electricity in the open market for customers who do not have an alternate energy supplier. If you do have an alternate supplier, it will be the price you have agreed upon with that company. 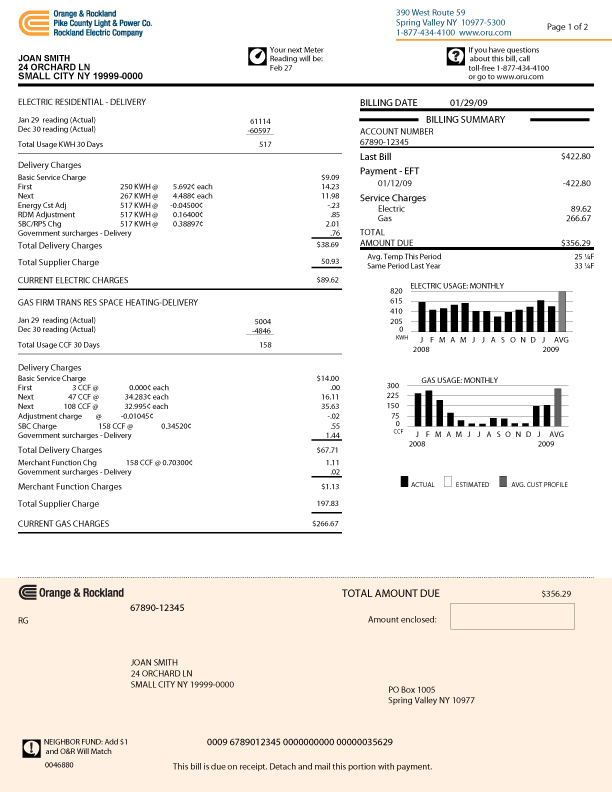 The right column simply resumes the bill, giving the basic information on the account, on the last bill, on this bill's total charges, and on your monthly electricity and gas use compared to previous months. This section summarizes the supply costs from the alternate supplier (also called ESCO). Green Mountain Energy Company is the separate energy supplier in this example. The customer here has chosen an alternate supplier (ESCO) for the supply of electricity and gas. The delivery is always taken care of by your utility company, but the supply can be purchased from an ESCO. In this example, the usage and the prices have all been set at 0, although this is only because it is a sample bill.